MAASIN CITY - Lone 2012 London Olympian in boxing Mark Anthony Barriga graced the National Boxing Championships together with Jade Bornea, the World Youth Boxing Championships bronze medalist. Both boxers arrived in time for the semi final bouts last Thursday. The two world class boxers were discovered in Mindanao. Barriga is from Davao del Norte and Bornea is from General Santos City. Both teams sent boxers to the recently concluded national tournament. Davao del Norte was the unofficial team champion while General Santos placed fourth. The two fighters face each other on top of the ring in an exhibition. The bout was made during finals yesterday. This is a tune up match for Bornea as he is set to compete in the Asian Youth Championships in Subic Bay on March 10-17. The tourney will be for boxers aged 16-18 years old. Barriga won over Italy's Manuel Cappai in the preliminary bouts with a score of 17-7 in the light flyweight division in London. But in the quarter final round he was deducted crucial points after leading 10-8 going into the third round and lost by the slimiest margin, 16-17, to Birzhan Zhakypov of Kazakhstan. Bornea defeated highly favored Jack Bateson of Ireland, 16-12, in the quarterfinal round of the AIBA World YouthChampionships in Yerevan, Armenia last December. He was outsourced by Murodjon Akhmadaliev of Uzbekistan, 25-14, to settle for the bronze medal. The audience at the Maasin City Gym were amazed at the action of the two youthful national boxers. Barriga, who was a veteran of several international tournaments, prevailed after three rounds. But there was no winner proclaimed as it was only a show of talent, an exhibition. But nevertheless, they received a wild applause from the full house crowd. 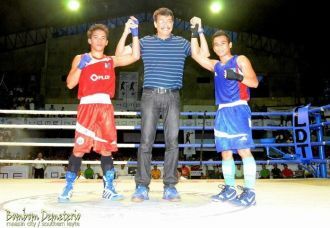 Photo: Mayor Maloney Samaco raises the hands of Jade Bornea (left) and Mark Anthony Barriga (right) after their exhibition bout. Photo by Atty. Bombom Demeterio.